When Simon joined the apostles, he was thirty years of age. He was married, had three children, and lived at Bethsaida, near Capernaum. His brother, Andrew, and his wife's mother lived with him. Both Peter and Andrew were fisher partners of the sons of Zebedee. The one trait which Peter most admired in Jesus was his supernal tenderness. Peter never grew weary of contemplating Jesus' forbearance. He never forgot the lesson about forgiving the wrongdoer, not only seven times but seventy times and seven. He thought much about these impressions of the Master's forgiving character during those dark and dismal days immediately following his thoughtless and unintended denial of Jesus in the high priest's courtyard. Simon Peter was distressingly vacillating; he would suddenly swing from one extreme to the other. First he refused to let Jesus wash his feet and then, on hearing the Master's reply, begged to be washed all over. But, after all, Jesus knew that Peter's faults were of the head and not of the heart. He was one of the most inexplicable combinations of courage and cowardice that ever lived on earth. His great strength of character was loyalty, friendship. Peter really and truly loved Jesus. And yet despite this towering strength of devotion he was so unstable and inconstant that he permitted a servant girl to tease him into denying his Lord and Master. Peter could withstand persecution and any other form of direct assault, but he withered and shrank before ridicule. He was a brave soldier when facing a frontal attack, but he was a fear-cringing coward when surprised with an assault from the rear. 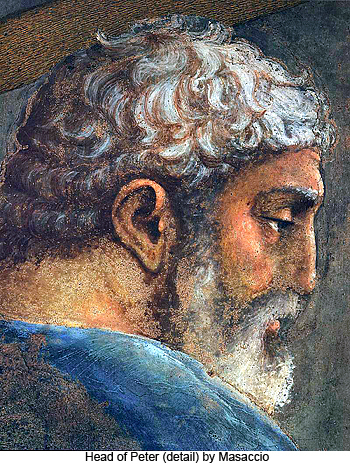 Peter was the first of Jesus' apostles to come forward to defend the work of Philip among the Samaritans and Paul among the gentiles; yet later on at Antioch he reversed himself when confronted by ridiculing Judaizers, temporarily withdrawing from the gentiles only to bring down upon his head the fearless denunciation of Paul. He was the first one of the apostles to make wholehearted confession of Jesus' combined humanity and divinity and the first—save Judas—to deny him. Peter was not so much of a dreamer, but he disliked to descend from the clouds of ecstasy and the enthusiasm of dramatic indulgence to the plain and matter-of-fact world of reality. In following Jesus, literally and figuratively, he was either leading the procession or else trailing behind—"following afar off." But he was the outstanding preacher of the twelve; he did more than any other one man, aside from Paul, to establish the kingdom and send its messengers to the four corners of the earth in one generation. After his rash denials of the Master he found himself, and with Andrew's sympathetic and understanding guidance he again led the way back to the fish nets while the apostles tarried to find out what was to happen after the crucifixion. When he was fully assured that Jesus had forgiven him and knew he had been received back into the Master's fold, the fires of the kingdom burned so brightly within his soul that he became a great and saving light to thousands who sat in darkness. Something of Peter's style and teaching is shown in the sermons partially recorded by Luke and in the Gospel of Mark. His vigorous style was better shown in his letter known as the First Epistle of Peter; at least this was true before it was subsequently altered by a disciple of Paul. But Peter persisted in making the mistake of trying to convince the Jews that Jesus was, after all, really and truly the Jewish Messiah. Right up to the day of his death, Simon Peter continued to suffer confusion in his mind between the concepts of Jesus as the Jewish Messiah, Christ as the world's redeemer, and the Son of Man as the revelation of God, the loving Father of all mankind. Peter's wife was a very able woman. For years she labored acceptably as a member of the women's corps, and when Peter was driven out of Jerusalem, she accompanied him upon all his journeys to the churches as well as on all his missionary excursions. And the day her illustrious husband yielded up his life, she was thrown to the wild beasts in the arena at Rome.